EdRacing.com a personal compilation of iRacing tweaks, links & information. (the monthly donation option doesn't work). 2018: Martin L. Sam Katakouzinos. Joseph G. Dries N. David H. MolnarRods.com Seymour H. Jordan H. John M. Tim G. A very special thanks to Mr David T.
2017: Tim B. MACCI. Jamie K. Ruddy H. Roman C. David C. Brad N. Johnathan K. Scott M. Dylan C.
06/2017: Facebook removed the (above) linked post. 8 months of links and info vanished without reason! especially with Facebook deleting information I was compiling. With support the site will remain hosted as is. Random posts may be added to facebook. iRacers don't be frustrated, be informed! iRacing's forum & iRacing's FAQs are a wealth of new and old information. I suggest scrolling through my Rookies page. Brake bias adjustment is now also available in Fixed Setup Series to a small host of vehicles. and every vehicle windshield has been improved with realistic reflections. and you should start to see wind-animated flags appearing at race courses. We are also launching preliminary support for OpenVR / HTC Vive headsets, and antialiasing in our virtual reality views. All of these along with a host of setup updates, bug fixes, and other enhancements are here for the 2016 Season 4 Release. When you use the "Share a Car Setup" capability on the Garage screen inside the Sim, the name of the setup is now also sent and will be displayed to the recipient(s). With the Virtual Mirror option enabled, a hotkey (Alt+M) has been added to show/hide the virtual mirror while driving. "Aston Martin DBR9 GT1 - Opponent cars are now capable of flashing their headlights." "We have added the ability for some of our cars to flash their headlights. Sports cars use this ability to notify a driver in front of them that they are about to attempt a pass. Mapping the function to a button will allow the headlights to flash on and off several times each key press. Ruf RT 12R Track "
* Tune to Win by Carroll Smith. * Drive to Win by Carroll Smith. * Ultimate Speed Secrets - The Complete Guide to High-Performance and Race Driving by Ross Bentley. * Physics of Racing Series (PhoRS) by Brian Beckman, PhD. * TurnFast – The Road Racer’s Reference Center. * SPEED CRAFT: Driving and Your Brain by Warren Chamberlain. * Smithees Race Car Technologies. * Into The Red - Limited Slip Differential. * iRacing's car setup guide – with Technical Contributions by Dale Earnhardt Jr. & Barry Waddell. * Telemetry quick start tips forum thread. * Going Faster! : Mastering the Art of Race Driving. The Skip Barber Racing School. Excerpts in thread. Also watch the video. Passing-101 also links to VRG's Continuing Education pdfs. iRacing DATA USAGE moved to Data-usage. ANZ iRacing series thread. (Started 2016s2). LQSPF PDF of FAQ FPS black box: (L)atency (Q)uality (S)kew (P)age fault. (F)orce feedback. You can also enable CPUMeter=0 in app.ini which displays as C. (See App.ini for more). The CPU meter measures only the CPU usage of the simulation's real-time thread (the one that runs the simulation, basically). Gray is the 1-second trailing average CPU usage. Purple is the 15-second trailing average CPU usage (only visible if it's higher than the gray bar). Two additional bars have been added to the "Comm" UI when “CPUMeter=1” is enabled in "app.ini" file. There is now an "R" bar which is the time the foreground/Renderer took and a "G" bar which is the time the GPU took. There is also a new option in the "app.ini" file named “CPUMeterAsText=1” which will turn all the "CPU" timing related meters into text that reports the times in milliseconds. From post: The bar is calibrated to be 60fps. If it doesn't turn red you are getting 60fps or better. The units are in milliseconds. Which means anything less than 16.6ms will be 60fps or better from the GPU's view. The Q-Bar on the frame rate/connection status meter area now has two side-by-side meters. The original value is in the left-hand bar, and shows the amount of packet loss from the race server to the simulation. The new right-hand bar (which grows from right to left) shows the amount of packet loss from the simulation to the race server. Note that the data for this right-hand bar is sent from the server to the simulation, so if there is a sudden loss of all packets sent by the server to the simulation, the value in this bar will not update. As before, each bar becomes full at 50% packet loss, though each is now about half the width of the original Q meter. Disabled drivers (people) - a forum thread that may help you source hardware. "That's in development" thread things to look forward to in iRacing. Customisable pit stop macros Alt+1 to Alt+5 (added 2013). #help in sim chat box displays pit commands. Auto backup replays and setups thread to Dropbox.com using symlinks. (Discussed in reddit post too). How to create mulitple iRacing configuration on your PC - thread. My pages for iRacing-Radio chat & messages and iRacing-Admin sessions commands. Feature Suggestions thread - "The Master Feature Suggestion Directory". iRacing Car Review - Buyers Guide thread. Essential reading, John Bodin's forum post links to old and new information. Easy link to tell others: edracing.com/bodin (redirects to iRacing forum). Random links thread by Michael C DeWeese. Easy link to tell others: edracing.com/deweese (redirects to iRacing forum). Dallara DW12 using "push to pass" thread. Development update thread by Tony Gardner. Real life drivers database thread. Sim Racing page on motorsports.com announcement | http://www.motorsport.com/sim-racing. Bodnar Video Signal Input Lag Tester (Monitor) Results - Todd's thread. (An ANZ club thread). Star Mazda - Aero Setup Guide thread. DW12 what do the numbers on the wheel mean thread (9/2015). 2FMSH - 2 Foot Magic Save Hax. Google has various links. iRacing QUICK START GUIDE revised March 2015.
iRacing's Graphics configuration wizard, for new installs and trouble shooting Removed 2015s2. iRacing's wheel/pedals configuration wizard, for new installs and trouble shooting Removed 2015s2. ** Calibrating pedals / wheels is still possible in sim options within a session. Tip: leave H pattern in neutral when configuring/mapping unless instructed otherwise. Tip: don't use the clutch when instructed to select a gear. 2015s3: "a button to launch the graphics config has been added to settings panel." Also added drop-down dialog to choose display adapter. I suggest renaming so you don't lose any edits - you can compare contents later. The next time you launch the sim, it should prompt you to reconfigure your graphics. joyCalib.yaml now has wheel/pedal calibration data. My own joyCalib tweaks. FFB (force feedback) - information moved to my FFB page. Logitech G27 FFB information moved to Logitech_G27. Steering lock settings. (Tip: turn off animated hands in options, they have limited rotation). 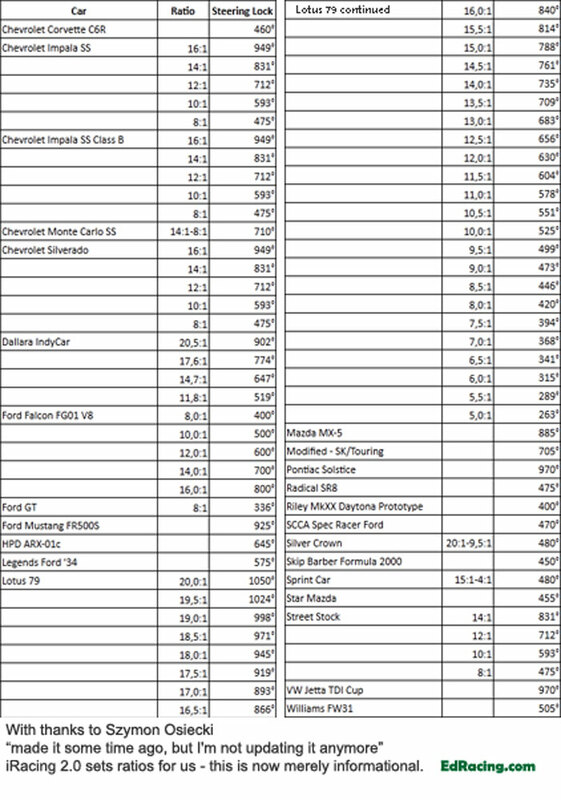 Steering lock ratios - image. Informational only, iRacing sets the ratios for us. "Steering requires double sided axis" see Sim-errors. Camera & User Interface page (added 2014s2), it may replace some info below. 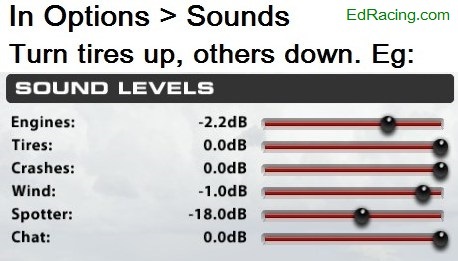 Tip: Improve driver input; turn tyre sound up in options. options-screenshot. joyCalib.yaml now has wheel/pedal calibration data. My joyCalib tweaks. app.ini located in documents/iRacing/app.ini has many settings to tweak. Before editing app.ini, ensure sim is closed and backup the original file. My app.ini page notes more settings at the bottom of page. * Hear sim when tabbed out: "muteWhenFocusLost" set to 0. * Black box position: [Drive Screen] "UIOffsetBottomPct=0" adjusts black box position on screen. * Roll effect: "DriverHeadHorizon"; forum thread. * Yaw: DriverRotateHead; forum thread. * DriverHeadNoPitch setting to detect elevation changes and DriverHeadWobble setting. * Seat height; (driverHeightAdj) moved to Camera-UI as it's not necessarily needed (2014s2 update). * "debounce" added to fix sequential double shifting. (More notes on my G27 page). * "carLowHiPadding=0.25" adjust car gap in meters before spotter calls clear. * steeringFFBSmooth to reduce FFB chatter - more info in my FFB and G27 pages. * Interesting view related thread with comments from David Tucker. Look up / look down in cockpit (added 2014s2). Map your keys screenshot. Motion Cockpit View MCV thread - I've never used it. Tahp Telemetry Assisted Head Physics thread - I've never used it. FOV. Field Of View adjustment. iRacing provides back/forward, up/down adjustment using [ or ] also shift+[ or ]. See more information on my FOV page. For customised track cameras, see thread Track Cams for Gourmets. download Glovepie from this forum thread. Read the thread too. Useful Applications Repositiory thread started Feb 2014 - I haven't compared lists. iFlag LED matrix race marshalling light board project thread (11/2015). Joe Real Timing display timing/position/counters/flags/drivers/iRating/position/fuel. Thread | Youtube overview. iRacing weather widget by Glenn Bowen thread | website. iRacing Setup Sync by Nick Thissen. Forum thread | website. (New: June 2014). Series Participation Visualizer script by Nick Thissen - thread. iSpeed forum thread. Highly recommended. Lap analysis. Share lap files. See live data. iSpeed via your network nessoft's help page (donation required to enable webserver). Troy Shulz's "Getting Faster Using iSpeed Lap Analyzer" (pdf) - highly recommened. See my iSpeed page for my answers to common questions. JJ spotter packs are better than the default spotter. Matt's 'Smedley' spotter pack thread. Creating custom spotter packs thread. We use a fallback plan when looking for the files, we look in your local directory first, then in the local .dat file, then up a level as needed till we get to the spcc.dat file where the master samples are kept. You just need to decide if you want to override the tj and steve pack or the default pack or want to make your own. To modify tj_and_steve you place your new 15SECONDS.WAV into the sound/spcc/tj_and_steve/ folder and we will pick it up in place of the existing one found in the tj_and_steve.dat file. On the other hand you can name it 15SECONDS_2.WAV and use the spmsg.txt file to add it to the list of samples that get played, causing us to randomly choose between your sample and the tj and steve sample. If you want to make your own pack then put it in sound/spcc/yourPack/ and any samples you don't provide will fall back to the default recordings that Greg Hill made for us (found in the spcc.dat file). TradingPaints.com to share custom paint designs. More info on my CustomPaint page. Voice Attack speech recognition website. Related: thread | thread with video | search. iRDDU dash display thread-1 | thread-2. iRDDU has evolved into a great tool and dash. Website. Egil's Delta Dashes for iRDDU thread | youtube. JRT - Timing / Calculator / Trackmap / Dashboard thread (5/2015). ProRacing Web Dashboard (Sept 2015) thread. (Some streaming overlays links - see OBS page). "Fast Dash for iRacing" free dashboard app for android/iOS. iRacing Thread | SwatterCo Website. A relatively new app that I haven't tried. The thread has good comments. Car setup viewer after exporting setups from sim. iPad as a button box thread (2012). iPad button box, a different one, thread (Jan 2016). Android / Apple using Roccat for button box thread. (See Bedo's post too). "Racing Rivals" (website) looks interesting, I haven't tried it. Wheel Check - see FFB page. Superceded FFB clipping monitor for optimal strength setting. (FFB now has it's own bar in FPS box). My BrassMonkey page: digital display or control your car (badly) on your WiFi device. Private message tool by Nick Thissen - forum thread. iRacing friend's list app by Nick Thissen - forum thread. irAmbience ambient sounds for iRacing - forum thread. VideoDashboard add telemetry overlays to videos forum thread | help docs | youtube. Olof's iAppStarter app starts other applications whenever iRacing is started | website. Included software automatically adds new cars and red line from iRacing data. User adjustable - not per gear. Another thread mentions a fix for Windows 10 (latest Visual C++ 2010 redistributable required). - Olof's shift light software works with or without M-Spec LED; includes audible tone. Adjustable per gear. Forum thread. - "Sound shift" forum thread. Website. - "ShiftTone" forum thread (download links didn't work last time I looked). - Optimal shift point links - Gear_Shifts. iRacing also has instructions for Atlas telemetry program in the Reference section. Some use Motec to read the data, some write apps, etc. iSpeed is all I use but not for pressures. - MoTeC Project 2015-Master-v6 by Peter C. - thread. And a related thread (6/2015) with various links. - Legacy telemetry (NR2003 Telemetry) is now disabled by default. It can be turned on again in the "app.ini" file by adjusting the "enableLegacyTelemetry=1" option. This interface is deprecated and will be removed from the sim next season. - Session times are now reported with 4 decimals of precision. - Your current car setup is now being logged to telemetry, both to the live telemetry that external tools can access and it is appended to the end of the disk based ".ibt" telemetry file. For the most part this is a good thing, but if for some reason you are worried that someone will use this to gain access to your setup you can turn off this behavior by setting "[Misc] irsdkLogSetup=0" in the "app.ini" file. So in summary, your car setup is now buried in every telemetry file you capture, so when you share a telemetry file you are potentially sharing your setup as well. - (OBS) Open Broadcaster Software website | youtube quick guide | thread Nvidia, OBS and Triple Monitors. - Mihail's Stream overlays thread | website. - iR TrackOverlay & Accelerometer (iRacing Browser Apps Addon) - Wolfgang's thread. I haven't tried setting it up. - Daniel Wood's 'Demo Lap Video Overlay' - forum thread. - VideoDashboard add telemetry overlays to videos forum thread | help docs | youtube. - HOW-TO : Using OBS with onboard GPU (No system load!) forum thread (Intel / nVidia related). - ATVO Appgineer.in TV Overlay for iRacing [WIP] iRacing thread. - More may be found on my OBS page. JSGME (JoneSoft Generic Mod Enabler) can be used to swap out your renderer.ini and app.ini files with just a couple clicks. This allows you to quickly swap between "painting mode" (iRacing in a window) and your normal settings (most likely full-screen). Once we have completed our maintenance this new testing will no longer be available, you will need to login to your member account as usual. Partial list of active members by country. Please let me know of a better list. I've lost my link. iRacing one billion laps, thread by Tony G.
Weekly driver count and series participation includes other stats. All tracks and cars offers a huge image to download. OSW / DIY Direct Drive wheels - various links on Products page. Logitech G29 and G920 information and photos added Logitech_G29. Logitech G27 information moved to Logitech_G27. I'll upgrade from my G27 (with Bodnar cable) one day. Reference to Direct Drive wheels on Products page. Double shifting "debounce" for any sequential shifter added to app.ini - read more Logitech_G27. Marcushwang's web log has terrific projects, scroll through his page (I don't know how to navigate it). Fanatec V2 Discussion part 2 thread. Fanatec new product info thread. Fanatec Club Sport Wheel owners thread chapter 2. Fanatec clubsport shifter SQ thread. Fanatec Shifter Twist fix by MockRacer. For me: filed. Fanatec - another frustration thread. Buying a Thrustmaster in Aus - read forum thread. Thrustmaster T300RS discussion - forum thread. Thrustmaster T500RS heat discussed - forum thread. Thrustmaster T500RS loose wheel fix forum thread and related thread. An older forum thread. Thrustmaster fix shown on Youtube. Loctite, use an appropriate one pdf of colour codes. Thrustmaster TX "Fix in progress (photos strip down etc)" interesting forum thread. Thrustmaster "T500 RS Wheel Failure (Latest "GT6" Version)" design fault? forum thread (May 2014). Thrustmaster T300RS losing FFB during race thread (Oct 2015). Includes tips for other wheels. Thrustmaster random titbit, http://www.guillemot.com/ the company behind Thrustmaster. (2014/2015) Based on posts by Fanatec customers, I have no desire to buy Fanatec. When reasonable & well seasoned people complain about a product, I take notice. Unrelated tidbit from a Fanatec related post - without a Fanatec wheel or the new hub, the FFB is disabled. Receive email alerts for new threads (announcements). - Log into iRacing forum Staff Announcements section. - Scroll to bottom of window and click on "watch this forum"
- You can do the same for any forum section or thread. Jump the Wk13 queue http://members.iracing.com/download. A billion laps thread by Tony Gardner. Be Nice To People thread by Tony Gardner. iRacing NEWS - iRacing killed old /iRacingNews/ links, I updated the ones I could find. Nurburgring coming to iRacing article (2014) | announcement | thread. iRacing Q&A April 2014 discussing Customer Support. iRacing Q&A Jan 2014. iRacing president Tony Gardner talks about "cheating". David Tucker clarifies cheating in a thread relative to debounce scripts. (Screenshot). iRacing's youtube clip: "Bathurst: Behind the scenes"
iRacing's laser scan process of COTA (Circuit Of The Americas) - Youtube. iRacing's "Building the 2014 BMW Z4 G3" - Youtube. iRacing article (2012) "Protests: by the numbers"
As the content grows it outgrows the 1 person maintaining it.